To some, the word boring means something unexciting. For the Elon Musks of the world, however, boring is really exciting. Of course, that second kind of boring requires doing some digging to yield interesting results. In case you didn’t see this one coming, this edition of the roundup digs deep into an interesting set of developments in the US online brokerage market that, at first blush, might seem small but actually reflect a new playbook for brokerages here in Canada. From there we’ll cruise through some interesting investing-on-auto-pilot-related news as well as present the latest updates from Twitter and what investors where chatting about in the forums. As anyone in Canada who’s ever shoveled a driveway or sidewalk full of snow knows, small changes add up. A recurring theme that we’ve observed in the online brokerage space is that change is taking place with online brokerages incrementally rather than in a sweeping fashion. With the exception of commission price drops, there hasn’t been an incredibly exciting product or feature that has gotten people talking or investors clamouring to sign up for an online brokerage account. This month, there were two modest developments that took place among two popular US online brokerages that stood out not so much because they were “big” but rather because they were small yet still reported on. The first was from Robinhood – the zero-commission online brokerage – which announced that they have developed a new “news filtering” system that rapidly screens and delivers ‘meaningful’ news about stocks or cryptocurrencies that investors are invested in or are watching. This feature was mentioned on not one Robinhood blog, but two. On their primary blog but also on their data team blog. More on that in a moment. Their new news delivery system is the kind of thoughtful feature that, in theory, should improve the user experience of a DIY investor – especially the active kind. Active investing is interesting in part because it relies on being able to digest a lot of information very quickly and make decisions based on that information. Even for technical traders who focus primarily on charts understand the value of a good news feed. Unfortunately plug and play RSS feeds are often unwieldy and embedded news streams are middling at best. Alongside the growth in interest in DIY investing and trading has also come the hyperfragmentation of information sources to the point where it is remarkably difficult for a DIY investor to find fast, reliable (trustworthy) news on particular stocks. Often times stories are generated about a particular company by bots that report on the movement of a company’s share price or earnings but lack real depth or insight. The sites are also crammed with advertising so the user experience is often terrible without an ad-blocker. A second, less obvious, observation about this feature release is that Robinhood pushed the information out on its company blog as well as on a more specialized company blog that focuses on the ‘nitty gritty’ details of the projects or products they’re working on. This level of transparency and coverage on seemingly small developments reflects the ‘tech’ approach of fintech. Technology is constantly improving and iterating, and many technology startups are not afraid to share what they’re working on or talking about the details of what they’ve worked on. So, for Robinhood to push out two blog stories on this feature release reflects that they not only ‘get technology’ but they also understand that telling people about what they’re working on enables the evangelists to stay connected to the brand. The people who love Robinhood have something to read about and are reassured that Robinhood is constantly evolving instead of being a static enterprise. On the other end of the news spectrum when it comes to reporting market information, TD Ameritrade marked an important milestone in their own content and news feed ambitions – namely the one year anniversary of the launch of their TD Ameritrade Network. The network consists largely of original market-driven content that now stretches across 14 hours each weekday. Coinciding with the anniversary is the small but important expansion of their network to the Amazon Fire TV platform. In its first year, TD Ameritrade’s network received just over 1.8 million unique visitors. Estimates on the number of Fire TV exceed 19 million monthly users internationally, so the opportunity to expand their content presence is certainly what Ameritrade is banking on. 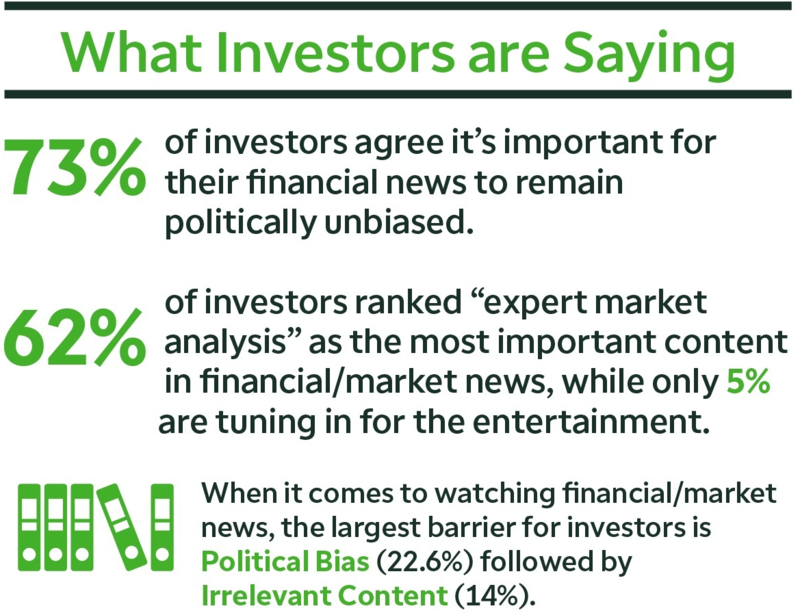 Interestingly, as part of the press release announcing the update, one of the stats of a survey conducted on behalf of TD Ameritrade revealed that 62% of investors ranked “expert market analysis” as the most important content in financial or market news and that for 14% of investors, irrelevant content is considered a barrier. While these stats reflect US audience dynamics, it is nonetheless interesting to see that filler content or ‘irrelevant’ content can get in the way of people tuning into (or even reading) content. The takeaway lesson here for online brokerages in Canada is that what counts as “news” in terms of feature developments is likely to be too small for major news outlets to cover. As such, the tendency to wait for a big development means that unless you have your own audience tuning in, very few people are likely to pay attention. Conversely, when technology fails, that WILL get headlines and coverage (see earlier in 2018 for evidence of that). The smarter move, it appears, is to put out smaller pieces of content more frequently. As Robinhood and TD Ameritrade have both shown, it is possible to sidestep or work in parallel with traditional media by publishing stories about what’s happening, as Robinhood so aptly put it, “under the hood.” In TD Ameritrade’s (and even TD Canada’s) case creating custom video content to compete with traditional news streams is possible and audience growth, while modest in size, is likely prominent when considering who those viewers are and what kind of assets they bring with them. Trust and transparency in the new world will be defined not so much by the ‘established’ reputation per se but rather the reputation for producing content on a regular basis. Scanning a Twitter or Instagram feed is just one of the due diligence tasks that younger investors are prone to doing since those are the channels they themselves will turn to. If discount brokerages are able to effectively share that they are working on interesting or new things, then that in and of itself should boost the credibility of their firm as an innovative one. Fortunately, for Canadian (and US) online brokerages, there are likely lots of little improvements being made all the time. Similar to shoveling the snow in the driveway, it’s best to do it in stages rather than wait until its all on the ground to try and dig out from under it. This week, the big news from RBC was the public roll out of the InvestEase robo-advice platform. After a year of testing pilots with staff and select groups, the new digital advice service is live. And, to sweeten the deal for individuals to try it out, for anyone who opens an account by March 31st, 2019, the annual management fee of 0.5% will be waived until October 2019 (hooray for new deals!). Rumours of Wealthsimple Trade now going live for some users are starting to trickle out. The zero-commission trading option appears to be surfacing for some DIY investors in Canada. Stay tuned as we find more chatter on the platform as it continues its rollout into RSP season. As we reported last week, Questrade Wealth Management got dinged by market regulators for violations of the best interest standard as part of its digital advice program Portfolio IQ. This week, the fine Questrade Wealth Management agreed to pay was made public and came out to $2.9M along with $100,000 in associated legal costs. Interestingly, even though there was some news pick up on the story, the response by investors in the forums was largely indifferent. Yet another DIY investor took to the forums this week enquiring about their index funds performance (or lack thereof) with Tangerine as well as interpreting their dashboard. Check out this thread to see the useful advice offered from other redditors and why being passive requires active effort. The week of Cyber Monday seemed apropos for the launch of RBC’s new robo-advisor, InvestEase. The reddit Personal Finance Canada forum weighed in on the arrival of InvestEase as well as the introductory promotion. Read more here. That’s a wrap on a very busy week for investors. Even though Cyber Monday is in the rear view mirror, be sure to keep your deal radar on as a new month is starting as is the ramp up to RSP season. On top of the offers from online brokerages, it appears that there are still interesting deals cropping up in the market – the best part is the shipping charges and delivery times are much better than a certain postal services. Whatever screen you find yourself at this weekend, stay warm and have fun!